This story is a great reminder of how much the world has changed......and even how much has not changed. Mary Rowlandson was a Puritan woman... in Massachusetts Bay colony, in 1676. It was a man's world. Women did not participate in town meetings and were excluded from decision making in the church. Mary was married to a preacher --a subordinate to her husband. If Mary questioned The authority of the established church she would risk terrible punishment such as public humiliation including a whipping in front of the church. As awful as life was for Mary as a puritan women, she gets captured by the Indian community. She fears life is about to get worse... At first life 'is' harder. "She feels as if her brain is banging against the wall of her skull. She had nothing to eat or drink except melted snow since the attack. She wonders how long it will be before her strength gives out. And what will happen then?" But her strength does not give out. She does endure horrific loss, and hardships....BUT..... we also watch Mary transform - re-examine her beliefs. Her thoughts are a jumble of sorrow and confusion. Mary has walked in two worlds - Puritans & Indians. The reader has an opportunity to have a 'real' experience of EARLY AMERICA through BOTH cultures!! !A wonderful well researched Historical novel!!! "She throws the bird up into the air, but it drops to the snow, flaps its wings twice and flutters toward the cage. Mary stares down at it. The cage is the only home Row has known. With all the strength that she can muster, she kicks the cage away. The bird rises, turns west, then north, darts over the roof of the house, and is instantly gone. "And we are left with the impending transformation of Mary White Rowlandson. Perhaps it is not only Mary's metamorphosis, but admittedly, our own. This is a story of how unspeakable tragedy closes the door on one's former sense of self. No going back. Forever changed and never the same. Eyes that see the world with a new vision while standing upon an unfamiliar precipice. Surviving, and yet not.I was drawn to Amy Belding Brown's book for many reasons. As a genealogist, I have come across Colonial family members who were the victims of attacks and massacres by Native Americans during the King Philip War and the French and Indian War. The parallels to Mary Rowlandson's experiences and to family members within my lineage were uncanny. They never lived to have the opportunity to tell their stories. Mary was the voice of the voiceless. This book is historical fiction, but based upon the actual captivity of Mary Rowlandson. Amy Belding Brown presents the life of Puritan America while also presenting the often denied humanity of the Native Americans. It is a story of relationships between husband and wife, parent and child, community members and strangers, and captor and captive. With the shock of horrendous episodes in life comes the reality that our life circle flows in a completely different direction.....touching ground that we are forced to tread.I highly recommend Flight of the Sparrow. You will come to realize that your own sparrow may have a remarkable name never before spoken. There is always something special about reading a novel based on the life of an actual person. This book is abut Mary Rowlandson, married to a preacher and living in the Massachusetts Bay Colony in 1676. She and her three children are captured by Indians, and kept for three months until she is ransomed. The Puritan society was a harsh, judgmental society, one to which I am so happy not to have belonged. The husband is the head of the household and all must submit. Children are not treated with much affection and even grieving is not allowed, everything is God's will and any emotion is seen as taking away from the glory of the Lord.Horrified at her captivity, she eventually learns to love the sounds of nature, the freedom the Indians have and the wonderfully affectionate way they treat their children. When she is ransomed she has trouble fitting back into strait-laced society that now views her as tainted.The story of her life is fascinating, the way she can see and empathize with the fates of the Indian. She realizes things are not as clear cut as they are presented. Wonderfully written book, vey thought provoking about the end of certain tribes on the East coast and how they were treated. The authors's note relates extensively what is true and what isn't as well as updating the reader about the lives of the actual people portrayed within these pages. Here is link to the actual story penned by Mary http://www.gutenberg.org/files/851/85..., a story that became a best seller in her day.ARC from publisher. 3.75★“I hope readers will come away with a sense of what it was like to live in Puritan culture and society…and an awareness of the complexity of English-Native relationships in the 1600s.”I would say she succeeded. I am fairly well read on the subject of United States Native American culture/issues in the 1700-1800s concerning tribes from the plains over to the western coast, but was not so enlightened with this time period or area. I certainly did not know that tribal members were exported into slavery to Barbados and other places. Inspired by actual persons and events, the author wrote a story of a woman and her children's kidnapping/murder, confinement/slavery, and eventual release back into their Massachusetts Bay Colony lifestyle. Her research was extensive and certainly convinced me that as a woman, I would have perished in Puritan society. I’m sure I would have been tried as a witch for rebelling against my husband. Most certainly, as a female, remaining as a slave to the tribe would have been preferable to colony life. I enjoyed the book and recommend it to anyone interested in this period on American history. TEN STARS to Amy Belding Brown's Flight of the Sparrow. Couldn't put it down. For the past several years I have felt that every book tells the same old sad stories just cast with characters of different names/descriptions. You would think the "old south" has nothing but poor little rich debutantes rebelling against their planned marriages. If I see another "secrets revealed" book where the heroine finds her great grandmother's lost love letters in a trunk in the attic or hidden behind a floor board, I fear I may retreat from reading new authors completely.At last, something different. The novel is based on a narrative written Mary Rowlandson, a real woman who actually was alive once upon a time. This is a story of a Puritan wife/mother living in the Massachusetts Bay Colony who was captured by Indians. Mary was already feeling constricted by the strict rules of her Puritan husband and the Puritan community. Her life with her Indian captors causes her to reconsider what she has always been taught and believed about the true meaning of freedom and independence. This is a story of survival, hope, and understanding love at its deepest levels. It was a mesmerizing story that leaves the reader considering your own meanings of freedom, independence, and love. Now to go back and read Ms. Brown's first novel - Mr. Emerson's Wife. Then eagerly anticipate her next work. 3.5 stars. An engaging book with some unignorable flaws.This story is a fictionalized account of Mary Rowlandson's life, particularly her experience as a captive of a Native American tribe for almost 3 months. I picked this book because I wanted to read a fiction book about Native Americans, and it's nearly impossible to find any that aren't cheesy romance novels (blech!). And although this one dances dangerously close to being a romance, it ultimately stays grounded in serious historical fiction. The author's description of Native American life, culture, values, and beliefs amidst the turmoil of the English invasion of their homeland is captivating, and the best part of this book.However, the author herself admits that when she read Mary Rowlandson's original account she was turned off by her racist and xenophobic point of view, and felt she needed to make it (and her) more relatable. While she succeeds in this, she ultimately makes Mary a little too modern -- her changes in thinking and the way she views the world after her experiences mirror something a 21st century person would say (or, more accurately, what we HOPE a 21st century person would say - Mary's revelations are our modern ideal, not our modern norm.) Although this is pervasive throughout the second half of the book, it is most succinctly captured in this sentence: "She is mindful of her clean, confining clothes - the tight bodice and sleeves, the hard shoes that pinch her feet, her cinched-in waist. She becomes abruptly aware of how her clothes restrict her and promote her submission." Really? That's some very 2nd wave feminism right there - just a couple steps away from bra burning. There are also some general linguistic nitpicks - the author writes that "[insert native American character] said something/spoke/gave an order in a language Mary could not understand" enough times that I was rolling my eyes by the end of it. However, overall I think this is a worthwhile book to read and covers a topic not often explored seriously in literature - and explored way too often in cheesy, slightly racist romance novels! Solid read based on the true story of a Puritan woman who was taken into captivity by the Native Americans in the late 1600s. She is later returned to her family and finds that she has changed in ways that make it difficult to live her previous life of piety and submission. Her questioning of the conventionality of the time leads to problems for her in her marriage and within her community. The novel mostly focuses on her internal struggle and frustration of trying to fit back into "civilized" life after spending many months living in the wilderness with the Native Americans who lived a much freer life. Three stars because I never felt her fear or despair- I was told of it and this keeps the reader distanced from the entire event (both during and after). Otherwise, this is an excellent piece of historical fiction writing. I received this book for free through Goodreads Giveaways.I had forgotten what it was like to be consumed by a great work of historical fiction. Flight of the Sparrow is everything historical fiction should be. I felt transported to seventeenth century Massachusetts and learned so much about the Puritan way of life as well as the Native American way of life. This time period is such a little known era in colonial American history and I don't recall King Phillip's War being taught in my history classes at all. As a result, I was so intrigued by the setting. But I also fell in love with the characters, especially knowing that their stories were based on true events. When Mary was first captured, I simply wanted her to find her children and escape, but I had no idea just how much her time with the Native Americans would change her. Soon, once she was back in English society, I yearned for her to find the freedom she so sought, just like the caged sparrow. James, the English speaking native, was perhaps my favorite character. His friendship with Mary was so powerful and they both showed such great care for each other, doing what was best to protect the other.My favorite parts of the novel, however, were those scenes that took place in the villages, while Mary was living among the natives. What they ate how they lived, how they slept in their wetus, the family dynamics, were all so fascinating, especially as I, as a reader, discovered this way of life along with Mary.If one is looking for a great work of historical fiction that not only teaches the reader, but moves the reader, Flight of the Sparrow is the perfect novel. A captivating story of the Puritan culture in 17th century colonial America. Mary Rowlandson is married to a strict and uncompromising Puritan minister. Her life revolves around serving her husband, raising her children and keeping her home. Yet, Mary has felt constricted and confined by the Puritan standards. Mary and her children are captured by Native Americans when their homes and village are brutally attacked. In her time of captivity, Mary experiences cruelty, but also is at times shown kindness. She relishes the beauty of nature and the freedoms which the Indian women are afforded. She forms a special kinship with James, who came from a Praying Indian Settlement, and was familiar with Christian beliefs. But what is to become of Mary if she returns to her English community? Can she forget her ordeals and conform to Puritan standards? A wonderfully well researched book, based on historical writings from that time period. Mary Rowlandson an English woman, mother, wife, married to her pastor husband when she is kidnapped by Indians when her town is raided. Mary feels disdain towards her captors in the witnessing of family and friends viciously slaughtered during the raid. Mary's faith keeps her going during her uncertain days in captivity. Despite her animosity and fear she takes notice of the kind gestures and goodwill her captors grant her. Mary begins to take solace in the Indian way of life and questions her 'freedom' prior to her abduction. She begins to understand how oppressive and stifling her way of living was in comparison to the Indian way of carrying on. She finds herself heavily conflicted with the difference between English and Indian societal beliefs and way of life. The biggest question facing Mary is freedom, she is confronted with defining and understanding freedom in toto. Wrestling with her societal expectations, religion and loyalty versus severe conflicts of mind, body and spirit she desperately navigates her way to find answers. Brown really brings the question of freedom to the forefront, leaving the reader fully engaged and provoked in deep thought. The conflict Mary faces is another thought provoking element making this novel fascinating. Entertaining historical fiction read addressing many issues of our nations past and present. Mary Rolwandson was a strong woman who embraced and relied upon her faith through a difficult trial. A woman unafraid to speak her mind or rebel when critical situations arose. A woman who is unknown to many and I applaud Brown for bringing her to light. I was put off by a few instances in the book leaving me with mixed feelings thus preventing me from giving it a higher rating. I'm sure most readers will undoubtedly enjoy Brown and Flight of the Sparrow. Extraordinary story about the early Puritan settlers that colonized the Northeast coast. This insightful book is the tale of Mary, a minister's wife who's courage and reason is tested when she and her children are captured by marauding Native Americans. This is not a one dimensional book. Mary is a sensitive, but moral woman. She helps congregants other shun, defying her husband behind his back. She is torn, struggling with the double standard and the lack of Christian charity. Her entire world is thrown upside down, when she is abducted and forced into tribal life. Her harrowing experiences are both heart wrenching, the graphic descriptions of the attack one of the most frightening things I've ever read. The author's detail is stunningly vivid. Mary must examine her own prejudices, questioning the values that she accepted against her own common sense. Based on truth, this is a wonderful book about the early settlers who set the platform of this country and had the strength to weather the obstacles and endure the hardships making them strong. This story had me hooked from the first page. Highly recommend if you are into historical fiction. I really enjoyed the captivity part. We can find kindness where we least expect it. Thank God we live in an age where we are not enslaved by Puritanical views. For me, this was a good read, but nothing made it special. About half way through the book I discovered that each character is real and each historical event happened. However, the author created her own story inspired from Mary Rowlandson's captivity.I appreciated the main character's development throughout the novel, but felt that I did not get the proper amount of time to see with the character to fully understand her. Personally, I felt that too little time was spent on her time as a slave in captivity and too much time was spent on her adjustment back to society. Her view of her Indian captors went from viewing them as savages sent by the devil himself to viewing herself as part of their society VERY quickly. I cannot say that such a drastic change in a person's POV is not possible, but it felt contrived and unrealistic. I didn't know a great deal about the puritans prior to reading this book. I can't say I still know a great deal, but having a small glimpse into that period of history perhaps provides some understanding of contemporary US cultural identity, as opposed to the culture in a country (for example) settled by convicts.My reason for reading this wasn't necessarily due to interest in the puritans, but rather the interest in the abduction storyline. Sadly Mary's abduction and subsequent time with the Nipmuc was only a small part of the novel, though her experiences returning to her husband after being ransomed were interesting. Where I struggled with the book was that I struggled to buy the premise that after three months with the Nipmuc, this good Puritan woman who had seen the Nipmuc brutally murder her kin and her neighbours would have such an about face as to idealise parts of their lifestyle. Three months? I don't buy it.In addition, I am very uncomfortable with language the author uses at times. I'm going to give benefit of the doubt here, but referring to the Nipmuc dwellings as 'hovels', calling Nipmuc dancing 'barbaric', and statements such as "The Indians are everywhere, like a plague of vermin" are, in my view, unnecessary. I presume the author was trying to show things from Mary's perspective, but I believe there are alternate ways/words the author could have demonstrated Mary's unfamiliarity and her condescending judgments without statements of this kind. I'm cynical that the only Nipmuc whose character was shown any sympathy and development was the one who was raised Christian.To be fair, the author showed aspects of the Nipmuc culture that Mary wanted to emulate; their love and cherishing of their children, the equal sharing of resources (food) amongst all in the society and so on. However, also shown are scenes of unnecessarily brutal and gratuitous violence, including against children.So, while the book had interesting parts I am somewhat uncomfortable with aspects of it. In addition, the book had mediocre writing at best - stiff and uninspiring. I won't be interested in other books by this author.I'm not having much luck with historical fiction set in the US. This novel is based on the 17th century captivity narrative of Mary Rowlandson. Mary is the respectable wife of a Puritan minister in colonial Massachusetts. While her husband is away from their town seeking military help against Indian attacks, the Natives attack again. Mary's home is destroyed, many of her friends and relatives are massacred, and Mary and her three children are taken captive. Her youngest child is mortally wounded in the attack, and Mary is separated from her two older children and enslaved to a female chief. Mary's fairly brief time of captivity is arduous, but also liberating in some ways. She is transformed from a woman who seeks respectability and safety, and assumes her husband will provide both, to a woman who seeks righteousness and truth. Suffice it to say that such a transformed woman will not have an easy re-entry in Puritan society. The Puritans are not portrayed in a flattering light in this novel. Their practice of keeping "moral watch" over each other feels like the Taliban or the East German Stasi, or -closer to home - the brutal conformity enforced by bitchy junior high girls. I think one of Brown's points is that oppression can seem right and normal, until you suddenly find yourself on the wrong side of it. Mary's experiences in captivity open her eyes to truth and force her to find a voice in a society where women are expected to be obedient and silent. I also liked that Mary is a mature woman in her 30s when she is taken captive, firmly middle-aged in that era. So she might be expected to lack the adaptability that a younger woman might have, yet she does indeed adapt. She also brings some experience and emotional maturity to her situation, which helps her to survive.I liked this book very much. It was right up my alley: well-researched historical fiction with a strong female character. Similar in that way to my own novel The Saint's Mistress, although written in a different style. I would read other books by this author. This is a work of historical fiction based on the captivity narrative of Mary Rowlandson. (Note: I have read the original work. It was assigned and discussed in several of my undergrad classes.) I must put a major emphasis on it being FICTION. I found that this work takes huge liberties with the character of Mary. Although it is true, only basic facts are known about her life beyond what we are presented with in her narrative, this novel's version of who she may have been just seems to really be a reach. I fully believe that her captivity and trials must have changed her life and that she may have suffered from some ptsd-esque symptoms when she returned home. But do I find it plausible that someone who hated and feared the natives so much, who witnessed unspeakable acts of violence from them during her capture and captivity, and who was with them for only three months was suddenly sympathetic to them and their way of life? No, not really. I just don't think she would have become as attached to their lifestyle as the book made her out to be, mostly because her original narrative comes across as so racist towards natives. Also, the almost love with the noble savage James was a bit much as well. The last thing that bothered me were the brutal descriptions of violence, especially at the start of the book. All in all, an all right read, the character and her very modern ways of thought were just too far fetched for me. Captivating readI really enjoyed this fictionalized account of early America and the profound impact that captivity had on the main character. While parts of the story seemed a bit drawn out, overall the plot moved along swiftly. I could easily feel the emotional current that flowed through the story. Flight of the Sparrow is a story that left me wanting to read more about the time period. The main character Mary is based on a real story. Takes place in 1676 and describes the life of a heroic woman living with HELL. She takes care of her family, lives in the bitter cold, and deals with problems that woman today could never deal with. Kindness is found though in the littlest things in life, and Mary finds what she can through determination. I loved the book for being true to the time period. Received this book through goodreads.com free. Thanks! Based on the lives and experiences of real people and historical events in the Massachusetts Bay Colonies during the 1650s. It is a tale that unfolds during the "Indian Hostilities" against the English and I loved how the author was sympathetic to the Indian people. Reading this did not make me proud that this country was founded by so much violence, enslavement, torture and death of such a noble people. Amazing book! The author did a wonderful job exploring the many sides of the of the Native and English conflicts in the late 1600's in New England. I was especially impressed with her portrayal of the Puritan culture. Mary Rowlandson was a real person, whose story is worth exploring even today, as we continue exploring how to accept differences in cultures in America. I suspected this was based on real people and historical history. Certainly very sad to read all accounts of the Native Indians and the early Americans. It was a very fast read and very well researched and written. A true a story based on Mary Rowlandson's Indian enslavement of 3 months. I was fascinated with her captivity and the aftermath of it. She was transformed into a new woman. Outstanding. I absolutely loved Mr Emerson’s Wife, so it’s no wonder I loved this as well! I was really moved by Mary’s struggles to understand what freedom truly means. I was also impressed by the expertise with which the author depicts Mary’s conflicted feelings about the Indians, especially during her captivity. And the love plot is absolutely superbly done. In all, it’s a story I will remember for a long, long time. For me, it struck a deep, resonant chord. And I have several people eager to borrow my copy next! 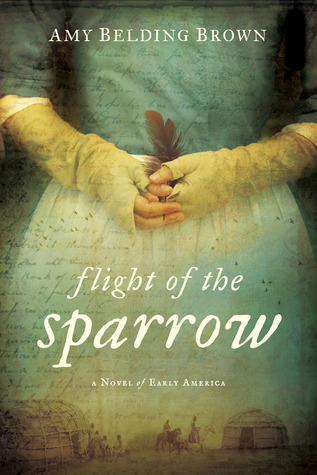 Flight of the Sparrow: A Novel of Early America is loosely based on the life of Mary Rowlandson. The premise of the book is based on history, but the author took some liberties in the feelings and language of what occurred. Normally when an author does this it bothers me, but she stated right up front what she did.Mary was married to Pastor Joseph Rowlandson, a Puritan minister in Massachusetts. At the time she was taken they had been living in Lancaster, Ma. Joseph was away when the Native Americans came to town and tore apart the town. Some residents were slaughtered right where they stood and others were taken as slaves. Mary and her three children were taken as slaves. They were forced to march for several days until they reached the Indian camp. Mary was torn apart from her children and forced into servitude of an Indian woman named Weetamoo (sp). Mary endured trials and tribulations, was forced to endure many hardships, but also was shown kindness among the Indians especially from a praying indian name James Prentiss. Mary was eventually ransomed back to her husband after three months with the Indians. What should have been a happy time turned into one where Mary was confused and felt confined while being back into The Puritan community. Mary's children were eventually ransomed as well and returned to her. Her children felt the same way as she did. Mary longed to be back out into the Wilderness where she felt free.Mary was eventually forced into writing an account of her time with the Indians by a man named Increase Mather. There is rumor that what was eventually printed was not Mary's true account, but was mostly rewritten by Increase.It has not been proven or disproven whether or not the story was in Increas's words or not but it would not surprise me in the least since Increase was a serious Puritan nut case along with the rest of the Mathers and most of the Puritan community at that time. For he was involved in the hysteria surrounding the Salem Witch Trials. “Flight of the Sparrow” by Amy Belding Brown is a work of fiction based on the life of Mary White Rowlandson. Although this book follows the few accounts of Mary, Brown has taken liberties with her personality, relationships and other aspects of her life, weaving Mary into an original and complex character. This book tells of how, in 1676, Mary’s puritan town had been attacked by a Native American tribe and she and her children were captured and forced to live alongside the Natives as slaves. Despite being held as a slave, Mary eventually feels more free than she ever had in her own community and she even begins to appreciate the culture around her. She struggles with these feelings and with her “duty” as a Puritan wife which causes this novel to explore faith, acceptance and what it means to be free. I personally found the novel to be very interesting as it gave me a look into the contrasting beliefs and lifestyles of Puritans and Native Americans. Because Mary was a woman struggling to live under the rule of her preacher husband and was aware of the injustice of slavery, modern ideas of equality were frequently explored throughout the book. These raised issues coupled with Mary’s internal battle and experience made for an engaging as well as thought provoking novel, which I can say I thoroughly enjoyed. If you like historical fiction, “Flight of the Sparrow” will not disappoint. I received a copy of this book as part of GoodReads FirstReads Program. This book retells the captivity narrative of Mary Rowlandson and goes beyond to frame that experience. It seems to have been based on a great deal of research from the reading guide included in the book. However, it also seems that the redeeming parts of her character and the parts of her that made me enjoying reading the story were entirely supposition if not entirely fictional. This left me disappointed after reading it through. Those who like their historical fiction on the accurate side will be disappointed. However, the setting description and commitment to portray Native cultures with historicity and compassion was delightful to read. This redeems this book as historical fiction even if the main character is a bit beyond historical. I very much enjoyed reading about this fantastical Mary and her Native captors. The plot device and title sparrow strikes just the right note for the way Mary is portrayed here. It at first made me want to read a copy of Mary's narrative, but after reading the author's comments in the reader's guide, I think I prefer Mary this way and will not. To me though a mark of good historical fiction is making the reader want to seek out that real history to learn more so in this the book is a great success. Amy Belding Brown - Amy Belding Brown, a graduate of Bates College, received her Master of Fine Arts degree in January 2002, from Vermont College of Norwich University, where she worked closely with Bret Lott and Victoria Redel. After living and working in central Massachusetts for nearly twenty years, she returned to her native Vermont in 2011, where she continues to write poetry and fiction. She is the author of Flight of the Sparrow, an historical fiction novel set in the 1600's in New England and published by NAL/Penguin, and of Mr. Emerson’s Wife, published by St. Martin’s Press in 2005 and now available in paperback Her publication credits include Yankee, Good Housekeeping, American Way, The Worcester Review and other national, international, and regional magazines. She lives in Vermont with her husband and their dog, Angel.